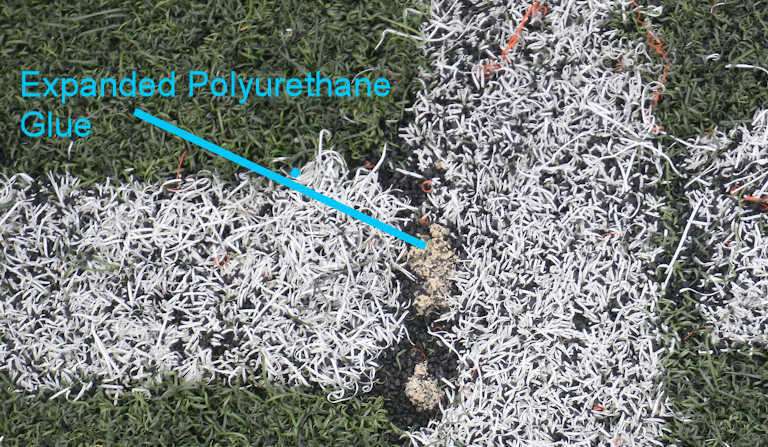 Synthetic Turf Repairs Don’t Always Make the Field Better | ASET Services, Inc. I was recently conducting a field test and inspection of an 8 to 10 year old turf field. The field like many had been repaired several times during its life, and like many I suspect it was only ever tested two times in its life, the first when it was new and the second when the school was interested n a new turf field. During the inspection we found some old repairs that were concerning. Repairs that might have been done differently if the company doing them had known that the field would be retested in the future to ensure that it continued to provide proper head injury protection. You may not be able to tell it but the photo above shows an area where the turf seam had failed. The company hired to repair this tear used an expanding polyurethane glue. The repair used so much glue that it expanded to be thicker than the crumb rubber and it was completely exposed. In this case the repair fixed a small tear in the turf and created a spot that produced a Gmax of 285 using ASTM F1936. This was disappointing because everyone in the turf industry knows that that any point of a field that creates a Gmax greater than 200 is a potential for a catastrophic head injury. The installer/repair company has to know that a hard glob of urethane would create a situation where Gmax was too high. As I looked at the field I found multiple instances of these repairs. Why would an installer or repair company do this with all of the emphasis on Gmax within the turf industry? First and foremost these repairs were done this way because the company doing them does not care. They are able to do this because schools rarely have their turf field retested after it was installed, so the company knows it can do virtually anything even it it compromises the safety of the field and there is a 99% chance they’ll never get caught. There are valid reasons why the best practice is to routinely retest the performance of a turf field. Those include guiding maintenance activities, guiding replacement activities, and ensuring that repairs restore the fields appearance without compromising the fields safety. Contact us today to discuss our synthetic turf field testing and inspection services, and to learn how we can help you keep your students and athletes safe.